The Kohler Command PRO EFI 824cc will be available on 2015 mower models. Kohler Engines added a new commercial engine to its existing Command PRO EFI lineup. The Command PRO EFI 824cc will be available on commercial mowers with 2015 model years, debuting on some mowers at GIE+EXPO, held Oct. 22-24 in Louisville, Ky. A propane version is slated for a later release in 2015. “This is the product, from a gas standpoint, I’m most excited about,” said Tom Cromwell, president of Kohler Engines and group president of Kohler Power. 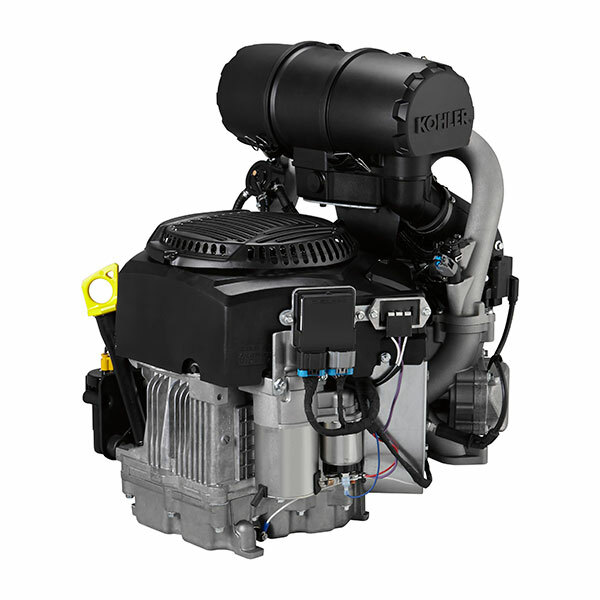 Due to its closed-loop, electronic fuel injection (EFI) system and new design, the 824 is Kohler’s most fuel-efficient commercial engine in its line-up today, according to the company. Johansen also said Kohler designed the engine with commercial mower trends in mind, looking to deliver the highest productively and lowest cost of operation for mowers with bigger deck sizes and higher ground speeds. The closed-loop EFI technology, which Kohler manufactured and designed in 2011, replaces carburetors by placing an oxygen sensor in the muffler to continuously analyze the air/fuel mixture. If the air/fuel mixture strays from the ideal level, the sensor triggers adjustments to the amount of fuel injected into the system. A rear view of the ECV880 model of the Command PRO EFI 824cc . In regard to design features, the 824 has an optimized intake manifold and features two spark plugs per cylinder head, enhancing combustion to maximize fuel efficiency and engine torque. The 824’s baffles, cylinder heads and specially designed crankcase fins contribute to the engine’s cooling efficiency. An optional electronic governor also is available, which delivers better throttle response, engine load pickup and stability. Dale Snyder, director of engineering at Kohler, added the 824 parallels the efficiency of the Command PRO EFI 747cc, with its torque peaking at 2,600 RPM and running on about one gallon of fuel per hour—the company anticipates commercial users can save at least $600 per engine per year in fuel costs over similar sized carbureted engines. And while the 824 is bigger than the 747, it fits the same OEMs as the 747. Snyder added the 824 was manufactured with carbon emissions restrictions in mind, too, primarily those relating to the California Global Warming Solutions Act of 2006 or Assembly Bill 32. To that end, Kohler will expand its EFI propane engine lineup to six products when it releases two propane 824 models in the second quarter of 2015. The propane 824 models include the PCV850 and PCV860, with 27 and 29 hp, respectively. The Propane Education & Research Council (PERC) partnered with Kohler to develop the propane 824, putting $975,000 toward the engine, with $680,000 going toward engineering and development and $295,000 for marketing. In addition to its financial and R&D backing on the 824, PERC also recently ramped up its Propane Mower Incentive Program in anticipation of GIE+EXPO. Beginning in October, landscape professionals can earn double the incentive dollars through the program. 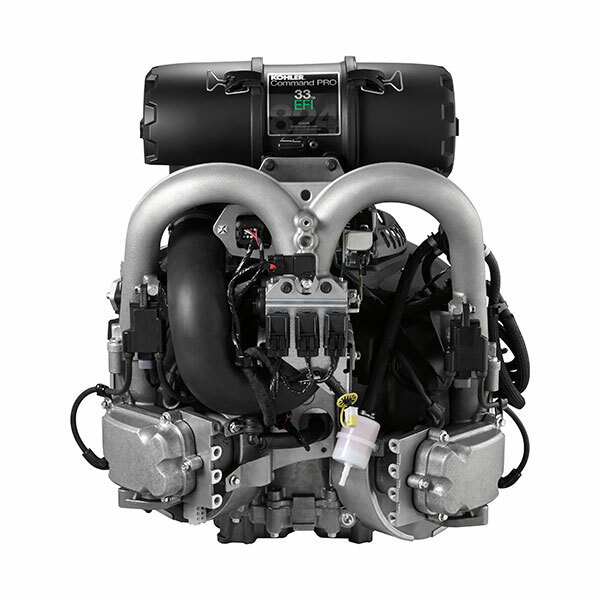 Developed over 31 months, the 824 will be produced at Kohler’s commercial plant in Kohler, Wis. All Kohler Command PRO EFI engines have a three-year commercial warranty.